The book, Dinosaurus by Steve Parker is a look into the many different types of dinos. There are pictures of these dinos with the name, location, period these types were alive, length, weight and even diet. Plus, there is so much more about each listed and some interesting history knowledge about the dinosaur you'll discover on the same page of each photo. What is great about a book like this is that this can be a great resource to help anyone understand the different dinosaurs that lived on the earth, and there were many!You always hear about the Trex and a few other well-known dinos that are in movies or TV shows. However, you never learn about some other types, with unique features like the Velociraptor. It's just a wonder to know what use to live back when humans weren't alive. Also, it can be a great guide for those who wants a job in this type of dinosaur research. Though for me it's a wonderful book of creatures that can aid in drawing and learning about something I never knew about before. Finally, this is a terrific book of really nicely illustrated with the photo of dinosaurs and information that will help you understand each type. I really find it to be a great resource book and perfect for anybody of any age! Wonderful book with great illustrations! Although some of the narrative was too advanced for my quite young children, they nevertheless spent hours with this volume. A big book with pictures of dinosaurs can't possibly be *bad. * But it was a little disappointing. The tone was a little condescending, holier-than-thou, more set on debunking "misconceptions" (did you know there's no such thing as a brontosaurus? that's cuz it's technically called something else! you're welcome! also, dinosaurs never chased down and ate elephants, because apparently some people think that that sort of thing happened! don't you feel almost as smart as me now?!) than on engaging with the reader about the possible implications of actual facts (like, that birds are dinosaurs).To be fair, I only really read bits of the beginning and a few random pages. But this is a coffeetable-type book, something that readers are expected to peruse at random. It's mostly page upon page of fact sheets about different species, with a nifty little diagram that shows how big the dinosaurs were (in relation to humans, how homo-centric...). A bit of a problem with the diagrams, though: given the range of dinosaur sizes, the scale for the diagrams changes from page to page, so it's not a good way to imagine the dinosaurs relative to one another, only relative to a human being...which isn't particularly realistic.I also didn't particularly like the style of the dinosaur illustrations. There's a bit in the front about how we can't know for sure what colors they were, and that all artist approximations are educated guesses. SO WHY ARE NONE OF THEM FUSCIA? IT'S NOT A GOOD SIGN FOR YOUR READERS WHEN EVEN THE DINOSAURS LOOK BORED. This book is a really well set out guide about dinosaurs. Each entry has a picture of the dinosaur they're talking about accompanied by a short synopsis of the dinosaur's history together with a factfile. The factfile contains interesting information such as the meaning of the dinosaur's name, how the name is pronounced, when it was around, and various other little bits of information. The quality of the images is very high and appealing to the eye.I would be very interested in purchasing this book for myself so I could have a pretty comprehensive guide to the many dinosaurs that were around in that period. We tend to only hear about a select few dinosaurs and when one reads this book it becomes clear as to why this is - there are way too many dinosaurs to cover them all in amovie, documentary or other such media.I would recommend this book to anyone who would like a good, easy to read guide on these now extinct ancient animals. I picked this book up a few years ago, and still reference it whenever I have a question about some dinosaur or other (which is more often then you would think! )A well laid-out format takes you through the various ages and introduces you not only to the major life-forms of that time, but also to how they are different from earlier ones, why those changes likely occurred, and what it meant for future changes down the road.A brilliant timeline at the front of the book does the best job I've ever seen of making time look big and man-kind look small in relation to it.I recommend this book to any dinosaur enthusiast, be they 13 or 33. The sections on early life are organized by era, but the ones on dinosaurs are still organized by type of dinosaur rather than by era. Because I'm looking for one that explains which dinosaurs evolved first, and how the family tree branched out, how pterosaurs and marine reptiles are related, and when dinosaurs started to get truly huge, this book didn't really meet my needs. Dinosaurs is a great book full of a lot of informative details of the reptiles of many different sizes that used to rom this world. 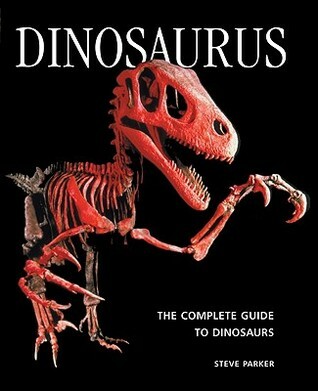 I truly loved to learn about all the different types of dinosaurs described in this book. I would recommend this book to any young dinosaur lover and fanatic.